Function Room at Pengwernydd01974 282422work Meeting RoomIdeal function room whether you are looking to organise a full day meeting, a corporate meal or a social gathering then we have seating available for up to twenty people. Our facility allows us to cater for numerous types of parties. This includes corporate meetings and parties, private parties, finger, buffets, weddings, and we have details of offsite catering for larger events. 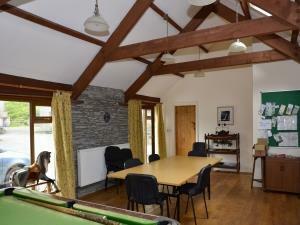 The games room has it’s own facilities for those who require on site catering with a kitchen, WC and utility areas. Ideal function room whether you are looking to organise a full day meeting, a corporate meal or a social gathering then we have seating available for up to twenty people. And of course,for those who travel from further afield there is the option to stay in our luxury cottages so you can relax and unwind between meetings and soak up the unique atmosphere here at Pengwernydd. From Aberystwyth take the B4340 signposted Trawsgoed, at Abermagwr turn left for Pontrhydygroes travel 5 miles Pengwernydd is on left with sign at bottom of lane.